I’d actually never spent a New Years Eve away from my family. No matter what happened during the course of the year, I was always home for the holidays, and never went to friends’ parties. To be totally honest, I was never invited to friends’ parties, but that’s another story. 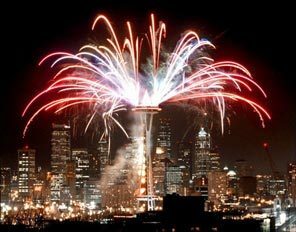 For a few years, we went to a party that a family friend hosted, and that was all sorts of lovely, but most years I rang in New Years watching the fireworks at the Space Needle on the local news and binging on the SciFi channel’s Twilight Zone marathon…which I credit as one of my largest influences as a science-fiction writer. The Twilight Zone’s whole shtick is based on quantity of imaginative ideas and graceful, short, well-written execution of them. But I digress. This year, I got even farther away from the city, leaving suburbia to go spend the evening with Intelligentia, his family, and a dear old friend of his who I had never met, but wanted to. It was a fantastic night. His father had knew stereo equipment he was eager to show us, and they played the Saint James Infirmary Blues through dinner. I learned how to make chilli poppers, and was surprised to realize that I actually liked them. It’s funny how you can hate a whole host of ingredients, but when people put them together just right, they become delicious. His mother cooked the enchiladas as his younger brother and best friend jammed on their clarinets. Intelligentia has a fantastically creative and musical family. Everyone plays instruments and just…creates. I envy him that. I always love getting to know the families of my friends though…it gives you so much more perspective and context when you consider who they are and why they grew into someone who means so much to you. If anybody needed evidence that Portland culture is NUTS, here it is. For those of you who don’t know, Seattle tends to think of Portland like an older brother that went to college and came back a hipster. Anyways, somebody gave me a shot glass with a mustache printed on it, so I did shots of water melon soda and pear and apple juice spritzers. All in all, it was a good night, if only because I was introduced to Rhapsody In Blue, which was a fantastic song the clarinet-playing friend introduced me to. Resolutions were made, but I won’t bore you with those. Mostly I just promised to read and write more, which I always do.